This Icon of wood has been continuously overflowing with myrrh for about eight years! Archbishop Daniel, welcomed the arrival of Kardiotisa, “The Tender Heart” myrrh-flowing, miraculous Icon of the Virgin Mary. Fr. Mark held up the Myrrh-Streaming Icon allowed the myrrh to drip from the Icon into the hands of each pilgrim. April 2, 2019 - Reported [here]. As millions of Orthodox Christians around the world journey the Sacred Period of Great Lent leading to the greatest miracle in the history of humanity – our Lord’s Glorious Resurrection, hundreds of Orthodox Christians from across the Cleveland, OH Metropolitan area were flocking to [Saint Vladimir Ukrainian Orthodox Cathedral, in Parma, OH] on Friday and Saturday, 29-30 March, 2019 to see what they believe to be a different miracle. Very Rev. Fr. 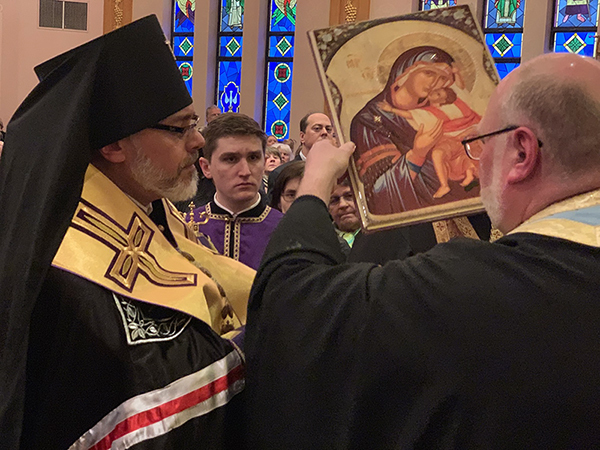 Mark Leisure, the pastor of [St. George Orthodox Church in Taylor, PA] delivered the Icon into the hands of Vladyka Daniel, who immediately removed his miter in order to venerate the sacred image of the Birth-Giver of God and presented the Icon to Very Rev. Fr. John Nakonachny and Very Rev. Fr. Michael Hontaruk- cathedral’s clergy for the formal procession and placement in the middle of the cathedral’s temple. 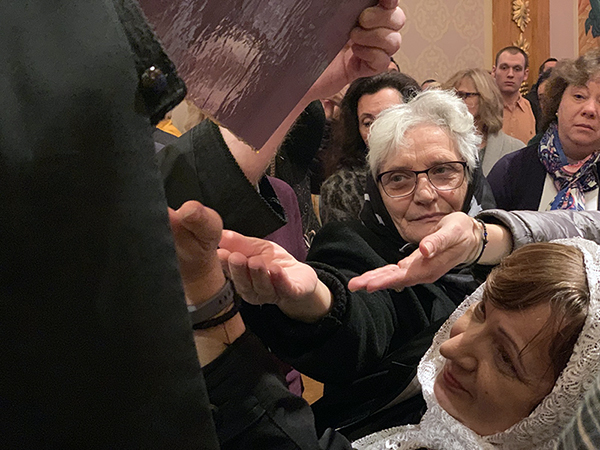 Numerous faithful in attendance partook in the Holy Mystery of Repentance, while receiving another blessing of the day – the ability to learn about the Myrrh-streaming Icon and to touch it with their lips. In his sermon, Archbishop Daniel reflected upon the call to holiness, while encouraging people not only to observe the miracle of the Icon but by partaking and learning from the miracle, and enabling each other to be the examples of holiness. Over the past three years, these miracles have happened again and again – with people finding healing from prostrate cancer, liver cancer, throat cancer, lung cancer, brain lymphoma, and almost every other form of cancer. There is even one oncologist who now, along with his medical treatment, directs his patients to visit the St. George Orthodox Church in Taylor, PA and be anointed by this miraculous myrrh. A young 14 year old girl had tried to commit suicide several times, and fallen into utter despair because of the bullying, ridicule and pain she experienced at school. While at Camp Nazareth, a Church Camp outside of Pittsburgh, she encountered the grace of God through this miraculous Icon, and found inner healing and hope. Months later she wrote the most beautiful four page letter to Fr. Mark, which he read to us, describing how her life has turned around by her experience with the Kardiotisa Icon. These are only a few of the wonders and miracles that were shared with those in attendance by Fr. Mark. In conclusion of the service, Fr. John Nakonachny offered the words of gratitude to the archbishop and Fr. Mark for leading the liturgical service and for their spiritual guidance and prayerful witness. On Saturday morning, Archbishop Daniel led another Moleben prayer service in front of the Myrrh-streaming Icon for the children of Taras Schevchenko Ukrainian Language School of St. Vladimir Cathedral. Concelebrating with Vladyka Daniel were Very Rev. Fr. Mark Leisure and Very Rev. Fr. Michael Hontaruk, assistant pastor of St. Vladimir Cathedral as well as Protodeacon Ihor Mahlay. Very Rev. Fr. John Nakonachny led the chanting with the children, thus prayerfully responding to the prayerful petitions of the service. About 200 children approached to venerate the sacred image, while Fr. Mark held up the Myrrh-Streaming Icon and having gathered all the children in attendance, allowed the myrrh to drip from the Icon into the hands of each child. Imagine, this Icon of wood has been continuously overflowing with myrrh for about eight years! Our God is a God of wonders and miracles. He is not bound by the very laws of nature, which He Himself has established. Sometimes in our contemporary, secular and materialistic world we try to insist that science and reason are the only source of truth. The Church honors and appreciates science and reason, yet we know that the Creator of all stands above all. We can never try to limit or keep God confined within our own boundaries. The miracle of the Kardiotisa Icon is just one small example of the unfathomable mysteries of life and of the Creator of Life, God Himself! Sometimes we can only observe in awe and wonder, and give glory to God for the way He reveals His majesty!